<table border=0 align=center width=90%><tr><td><img src=http://cdn.nhl.com/canucks/images/upload/2007/09/macri_headshot.jpg border=0 align=left vspace=1 hspace=4>There’s either too much, or not enough, going on to write a cohesive blog on one subject, so here are some quick hits. I love goalie masks, and having a goaltender who changes his regularly makes my heart smile. 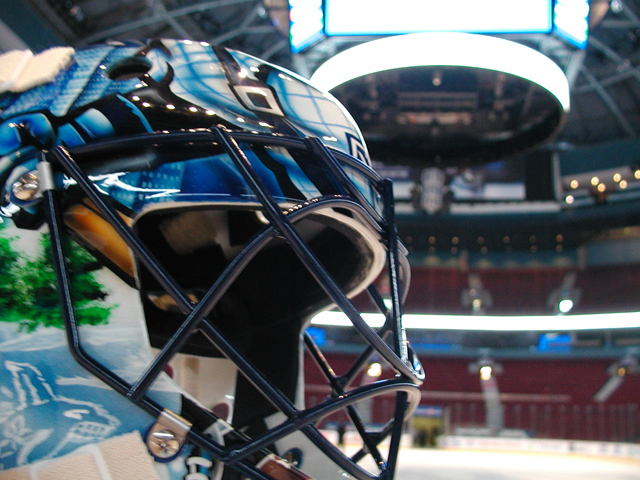 Luongo’s new bucket is really nice. Love the colour scheme, and it’s shiny like over-ironed polyester. Plus it features a nice portrait of Al Borland from Home Improvement. Kudos, Roberto - that was a great show. The call on the ice was warranted, but any comparisons to the hit that Steve Downie delivered earlier in the week certainly is not. It’s unfortunate that Roy was hurt, but players learn at an early age to avoid turning into a check. If Roy doesn’t turn, he’s not taken off the ice on a stretcher. Roberto. Please. Not funny. I realize that this comment might have been off the cuff, but I don’t think that you fully understand how fragile the Canuck fanbase is when it comes to the subject of goaltenders. We’re not that far removed from trying to convince ourselves that Martin Brochu could be a viable option. Honest to God. Martin Brochu. Not only does he stick with the big club, he’s penciled in to play on the top line with the twins. As impressive as that is, Alain Vigneault impresses me even more. Too many coaches would be quick to bury a young, offensive prospect on the fourth line, letting him flounder until he gets sent down to the minors. Vigneault is giving Raymond every possible chance to prove that he can play in the NHL. I’ll say it, I miss Burke. Nonis is doing a great job, but he’s never going to proclaim that another GM has “run (his) team into the sewer,” as Burke did when asked about Kevin Lowe and the Dustin Penner offer sheet. Some might say that Brian should do his best Ron Burgundy impersonation and keep it classy, but dammit if he doesn’t make the last week of preseason entertaining. I won’t say that the league needs more characters like Burke, but having one General Manager who speaks his mind certainly doesn’t hurt. If Anze Kopitar doesn’t exist, this isn’t such a thorn in the side of so many fans. However, people need to cut Bourdon some slack here. He’s 20 years old, and defenseman who can be impact players at that age are few and far between. It’s almost unfortunate that Luc had such a good first camp, as it drew early comparisons to Calgary’s Dion Phaneuf, the only caveman to ever play in the NHL. Consider this: Mason Raymond, a guy who is making news partly because of his age, is 22. Also consider this: at the age of 20, I still watched Boy Meets World whenever it came on (the fact that I’m now 25 and continue to do so is irrelevant). Give Bourdon another year or two. In a recent poll of GM’s around the league, Roberto Luongo was almost unanimously chosen as the player they’d want to build a franchise around. After Sidney Crosby, that is. That’s great and all, but what really caught my eye was the fact that one GM (I’m looking in your general direction Burke) threw in a vote for Scott Niedermayer. I can’t be certain, but it might not be the wisest choice to build around a player who is on the fence about retirement. Just a thought. Mike - I look forward to all of your blogs - humorous, informative - and usually with references to movies or books that I love! Keep it up, and lets hope that his season isn't heartbreaking or staggering - but just genius!